Your body uses protein to build and repair tissues. In fact, protein is an important building block of bones, muscles, cartilage, skin and blood. Protein is a ‘macronutrient’, which means that you need relatively large amounts of it to stay healthy and prevent injuries. Your body does not store protein, so it has no reservoir to draw from it when you’re running low. After lots of exercise it’s therefore important to eat protein-rich foods to help your muscles recover. 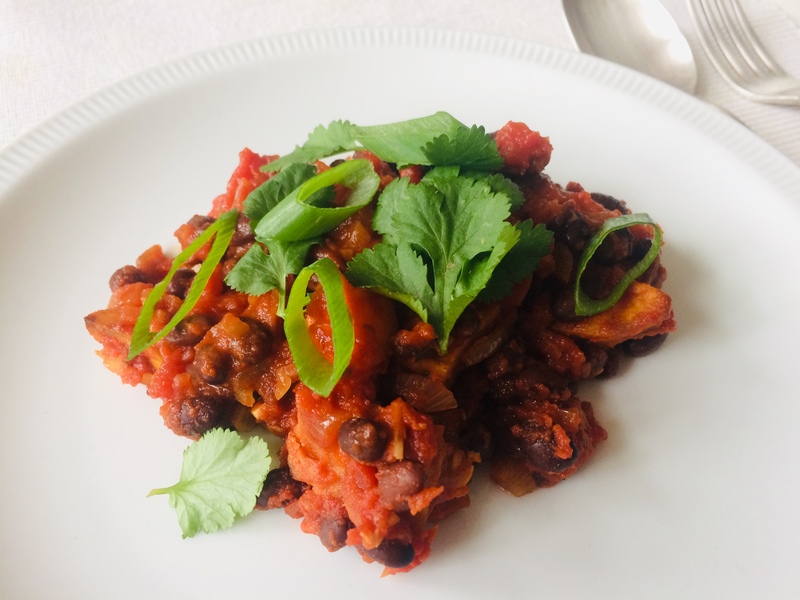 Meat and beans are great sources of protein, so dietitian Andreas Leertouwer has created this delicious recipe for chilli con carne with turkey or chicken and black beans. You can make it a vegan dish (chilli sin carne) by leaving out the meat and doubling the amount of beans (black beans, or any other kind of beans you like). Preheat the oven to 200° C. Line a baking sheet with backing paper. Toss the sweet potato chunks with 2 tablespoons of the oil until well coated, then spread on the baking sheet in a single layer. Sprinkle with a good pinch of the sea salt. Roast for about 20 minutes or until softened, stirring a few times. If you don’t have an oven, bake the potato in a pan until cooked and browned. Let it cool. Heat 2 tablespoons of oil in a large, heavy-bottomed pot over medium heat. Once the oil shimmers, add the onion, garlic, cumin, paprika, chili powder and a big pinch of salt, stirring to coat. Cook for 8 to 10 minutes, until softened. Add the minced turkey or chicken. Cook, stirring a few times, until the meat is cooked through and its moisture has evaporated. This should take about 20 minutes. The turkey or chicken should be well incorporated into the onion mixture. Skip this step if you make the recipe sin carne. Add the tomatoes, their juice and a pinch of salt. Increase the heat to high and add the water. Once the mixture comes to a boil, reduce the heat to low and cook, uncovered, for 20 minutes. Stir in the beans and the sweet potato; taste, and adjust the seasoning as needed. Cook for 15 minutes to blend the flavours. Serve the chilli in bowls or deep plates and top it with chopped cilantro. Add a small green salad to your choice. The sweet potato can be roasted, cooled and refrigerated a few days in advance. The chilli can be refrigerated for up to 3 days or frozen for up to 3 months.